Marine Corps Base Hawaii (MCBH) is located on Mokapu Peninsula on the windward side of Oahu, approximately 12 miles northeast of Honolulu. 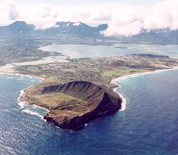 The base was previously called Naval Air Station Kaneohe Bay and is often still referred to as "K-Bay." Major units stationed on base include the 3rd Marine Regiment, Marine Aircraft Group 24, Combat Logistics Battalion 3 and Reconnaissance Wing 2. The airfield at MCB Hawaii is home to AH-1W SuperCobra attack helicopters, UH-1Y Venom utility helicopters and CH-53E Super Stallion transport helicopters. The Mokapu Peninsula is a beautiful region and offers those who are stationed there many opportunities for recreation. On MCS Hawaii there are The Cabanas at Kaneohe Bay which provide affordable waterfront lodging. This MCB Hawaii directory features the critical info you'll need to navigate through the many facilities and recreational opportunities available on base.